1. Sauté the sausage in a Dutch oven over medium-high heat until lightly browned. Remove and set aside. Add the red pepper to the Dutch oven; sauté 2 minutes. Add the celery, scallions, parsley, garlic, and thyme, stirring well. Cook another 3 minutes then add the rice and stir well. 2. Reduce heat to low and cook 5 minutes. Stir in the sausage, tomatoes, broth, bay leaves, salt, black pepper, and cayenne. Cover and cook 15 to 20 minutes or until the rice is done. Stir in the crawfish and lemon juice and cook until the crawfish are just done. Serve warm. 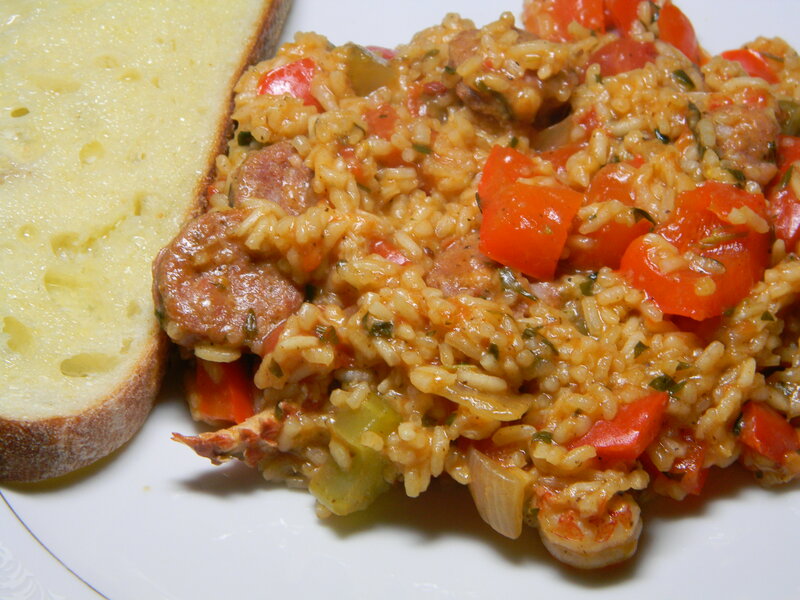 Chere, there isn’t anything much better than a good Jambalaya. So glad you liked the mud bugs. But, I don’t think we will get you to like the raw oysters, will we.